5 samples of coffee from the same roasted batch were pulled in increments of a minute until the roasting was completed. The samples were then ground, sieved, brewed and diluted. 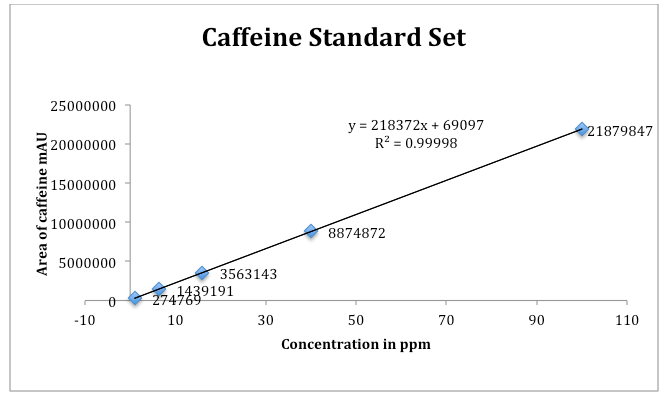 Using a HPLC method, the areas of caffeine for each solution were analyzed against a caffeine standard set created. The coffee samples presented a trend of increasing area. However, the data cannot be taken at face value. Coffee beans physically expand in the roasting process so other steps such as an average bean count along with density were taken. With general roasting knowledge, density and other calculations, the HPLC data shows a minor increase of caffeine with negligible change in the final, darker roasted samples as the density decreases and bean count increases. Further calculations were made to illustrate a consumer serving. Coffee is a popular beverage, most notable for its’ caffeine content. In the specialty coffee industry, coffee is often roasted lighter (compared to commercial roasteries) to highlight nuanced flavors that can be specific to a terroir or processing method. Along with the roast, different brewing methods whether manual or an automatic batch brew, can effect the extraction and tasting notes. A 1:16 ratio of coffee to water is thought to be the ideal brew balance of tastiness in coffee, according to the Golden Cup Standard1. Calculations were done to show the amount of caffeine that would have been present to this standard in a serving. Portions of coffee extraction methods were replicated from Comparative study of polyphenols…2 and Effect of roasting degree…3. In addition to studying caffeine levels with HPLC, other factors were taken into account. Coffee beans vary in bean size in its’ raw state and then will expand with roasting. The longer the coffee is roasted, the more the beans will expand. For this reason, an average roasted bean count was taken for each sample. Because the coffee used was a small amount (2 grams), 10 grams were weighed and then divided by 5; this was done 3 times. Another variable calculated was the density. Using the same ground samples, 5 grams of each sample was sieved through the same mesh size used for the extractions and placed into a graduated cylinder; the base was tapped gently until the coffee amount stopped settling. 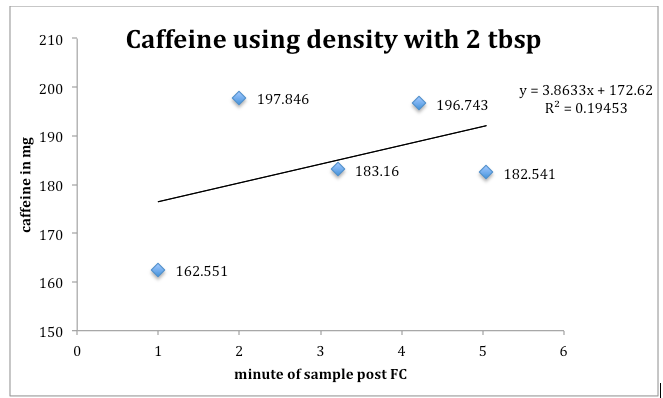 By analyzing the additional variables with the HPLC results, a more comprehensive overview of why there might be an increase of caffeine between samples was displayed. At first glance of the HPLC areas, there is a small increase with the exceptions of sample 4 and 5 reading very similarly to each other. Looking at the next column Caffeine by L of 1:10 dilution (mg), it shows that samples 2 and 3 along with samples 4 and 5 are very similar to each other. The last two columns were examples of applying the caffeine data to realistic industry/consumer standards of coffee to water ratios; the biggest variance in numbers are when applying the 2 tablespoon per serving rule; the calculations for caffeine increase and decrease between samples 2 through 5. 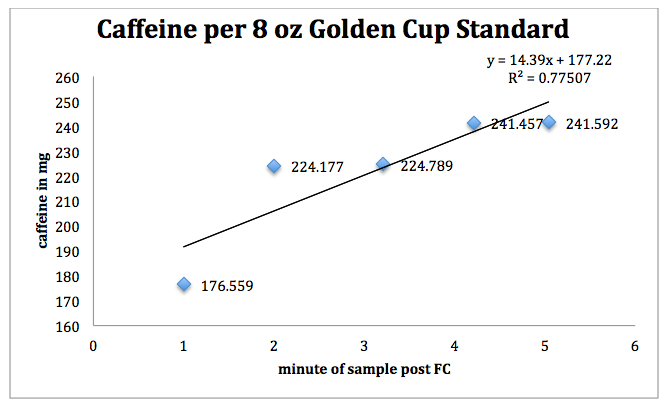 However, in the Golden Cup Standard per 8oz serving, caffeine numbers not only increase, we see that there is almost no change between samples 2 and 3 and 4 and 5. Sample 1, the lightest roasted coffee shows the largest variance of caffeine across the data compared to samples 4 and 5, the darkest roasted samples. However, when comparing the data of number of beans, it is under 2 whole beans (1.734 beans), and density difference of 0.0780. Also noted, the time difference between Samples 4 and 5 are 43 seconds which the Color Track reading a difference of 1.64 points. The TDS measurements show a consistent extraction with a difference of 0.04 ppm between the solutions. 0.0111g of caffeine4 (1,3,7-Trimethylxanthine, 194.194 g/mol, mp 460° F) was added to 50 mL of heated Milli-Q water. Once dissolved, solution was cooled and then topped off to 100 mL of Milli-Q water. Creating a serial dilution, the following solutions were created: 40 ppm, 16 ppm, 6.4 ppm and 1.02 ppm. The solutions were then filtered into vials for HPLC, including a blank vial. Samples were analyzed in an LC-2010A HT for 8 minutes. Results were graphed and the following equation was extracted: y=218372x+ 69097 with an R2=0.99998. In the same batch of coffee being roasted, 5 samples of coffee were extracted using the coffee trier by the minute starting at first crack (FC) and cooled immediately. The whole beans were ground fine and then sieved using mesh size 25 (26 OPN). 2 grams of each sample were weighed out and then added to 80 mL of boiling DI water. The solution was boiled for 15 minutes, stirring occasionally. A watch glass was used as a lid to help limit evaporation. After 15 minutes, the coffee was cooled and then filtered into a volumetric flask. Each solution was topped off with DI water to 100 mL, shaken and a TDS reading was taken. Each solution was then diluted again to meet a 1:10 ratio. Using a syringe, each sample was re-filtered into vials for HPLC. Two blank samples were also included. Results gave the following areas from post FC minute 1 to 5: 5509951 mAU, 6983759 mAU, 7000989 mAU, 7511259 mAU all at 4.489 minutes, and 7515340 mAU at 4.486 minutes. 2 Hecimovic, I.; Blescak-Cvitanovic, A.; Horzic, D.; Komes, D. (2011). Comparative study of polyphenols and caffeine in different coffee varieties. Food Chemistry, 993. 3 Casal, S.; Oliveira, M.B. ; Ferreira, M.A (1999). HPLC/Diode-array applied to the thermal degradation of trigonelline, nicotinic acid and caffeine in coffee. Food Chemistry, 482. 4 National Center for Biotechnology Information. PubChem Compound Database; CID=2519, https://pubchem.ncbi.nlm.nih.gov/compound/2519 (accessed Dec 11, 2018). Lead Roaster during the day, part time science student at night. 15 years in the specialty coffee industry. Avid reader of books, advocate for libraries.